I am getting the itch to do some spring cleaning. I don’t mean washing windows, vacuuming curtains or polishing silver. I mean digging out from under the landslide of paper that has built up over the winter, so that I can see my kitchen counter again. Paper piles are everywhere. While it may look disorganized, it is anything but. Each pile holds something specific: bills; coupons; kids’ school work; recipes I intend to try someday; holiday photo cards sitting around since Christmas; craft and school paper for the kids; stationery, greeting cards and mismatched envelopes. There’s a place for all of it. Unfortunately, that place is usually my kitchen. The experts say, control the paper or the paper controls you. Sort everything as it comes into the house and toss the unnecessary. Don’t let it pile up. Easier said than done. My paper collection was sorted. Each piece made the pile because I need, or intend to keep, or might use it … someday. My first step is to go through each pile and toss what is no longer keepworthy: the expired coupons, the Christmas cards and kids’ schoolwork I choose not to keep, the recipes that no longer look so delicious, the craft paper and note cards with bent corners. I make a mental note to stock up on whatever needs refilling, such as craft paper, stationery and all occasion note cards. When I am finished, most of the piles are still there, but smaller. Some, like the Christmas cards, have been banished, only to return again in December. But hard as I try, I can’t banish all of it. There will always be paper that requires my attention, such as school permission slips that need signing or bills that need paying. The trick is to hide them in plain sight. 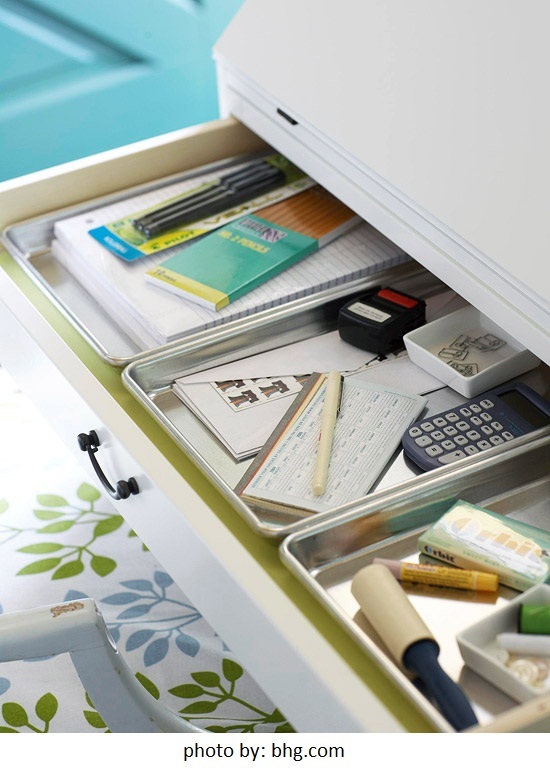 And the best organizing ideas are the ones that solve that problem. Baskets, bins or slotted mail holders are ideal for this, and look great sitting out on a desk or shelf, or mounted to a wall. Craft paper can be stored in trays or hanging files as shown above from bhg.com. 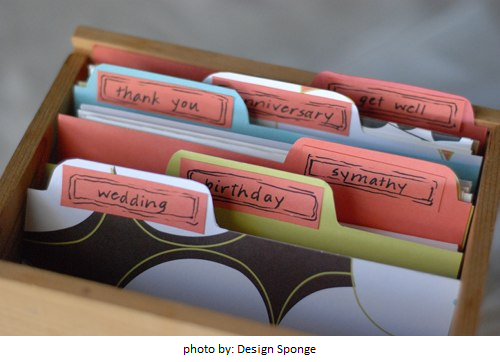 Note cards can be safely stored in dividers for each occasion like shown in the image above from Design Sponge. And the kids’ artwork and school papers I can’t bear to toss will go in a box, one for each child, tucked away in a closet. Before long, the chaos is contained. My recycling bin is full. And I have my kitchen counters back, at least for now. And I intend to re-stock my stationery collection at Pear Tree with some fresh new personalized note cards for spring. ← PreviousAnnouncing our Graduation Contest Winners!